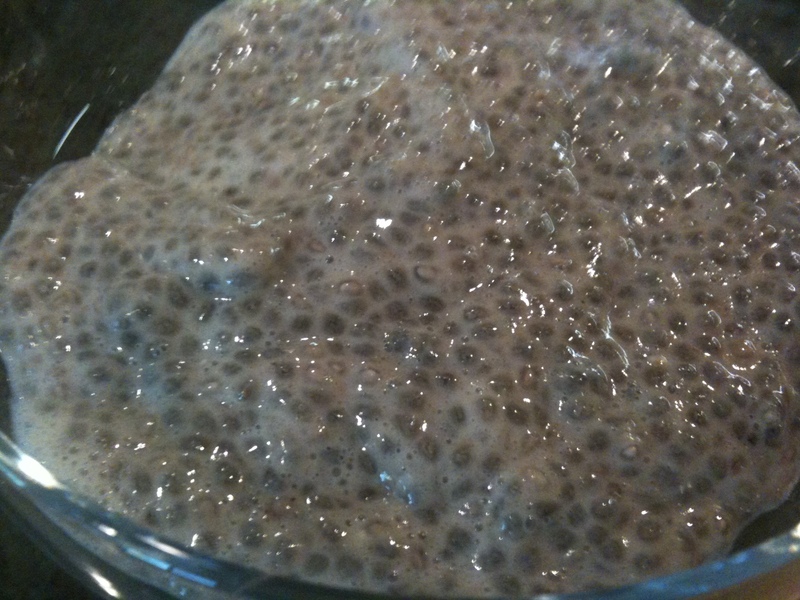 I recently discovered chia seeds and have been experimenting with them. This breakfast is my latest obsession! 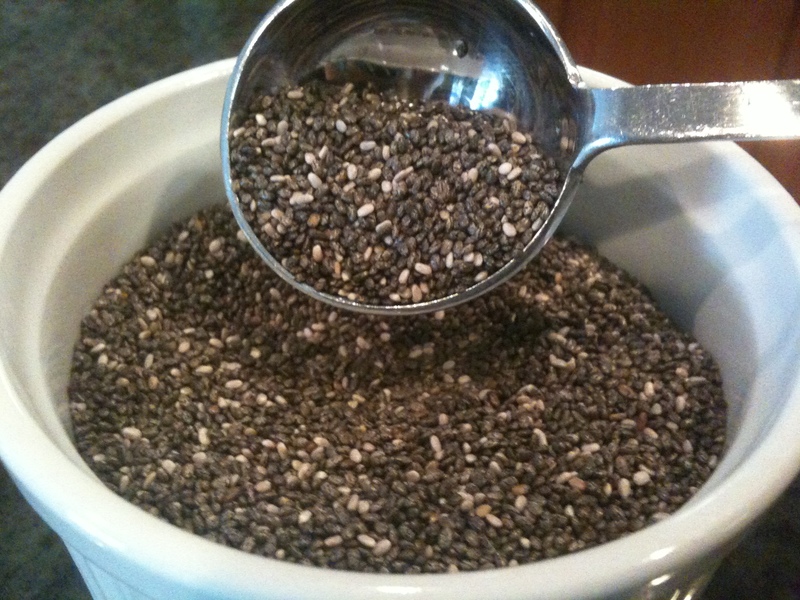 Chia seeds come from the plant Salvia Hispanica that originated in Mexico and South America. These tiny seeds are full of beneficial fats and are becoming a popular “super food” in America. Health gurus like Dr. Mehemet Oz and Dr. Andrew Weil have been touting the many benefits of chia seeds and their popularity is growing daily. A serving of these little wonder seeds is full of Omega-3 fatty acids, protein, and fiber. They are also very filling and sustaining which makes them great for breakfast. After trying them in smoothies and sprinkled on my oatmeal, I decided that this is the way I like them best. 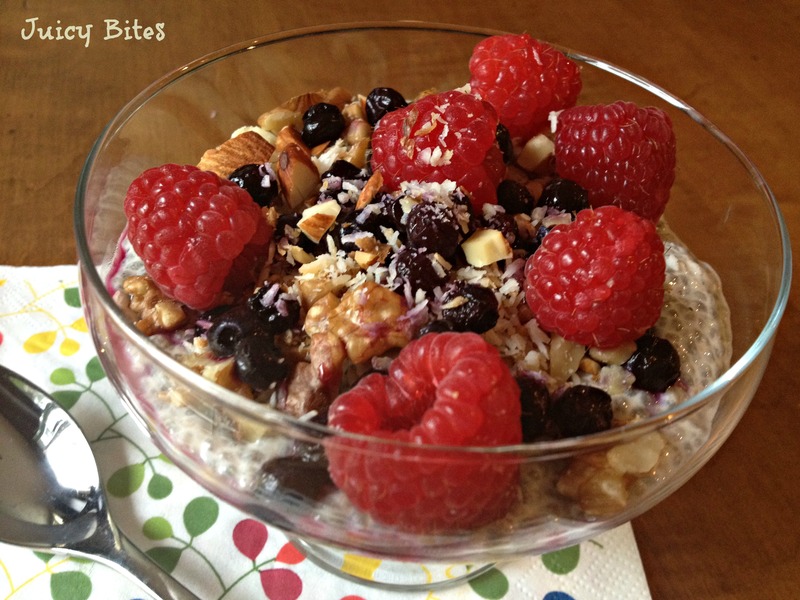 It’s like a breakfast pudding topped with lot’s of yummy toasted nuts, coconut, and berries. I feel like I’m having dessert for breakfast! You probably won’t find chia seeds at your local chain grocery store, but they do sell them at Whole Foods, Trader Joes, and other health food stores. You can also find them on Amazon. 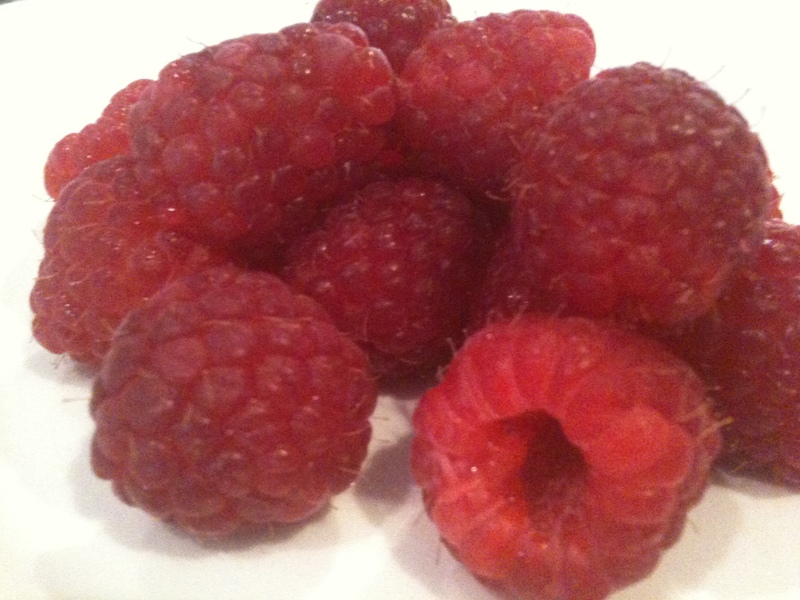 I bought them at San Clemente’s local health food store, Hanson’s Market. The chia seeds expand in what ever liquid you put them in and thicken to a creamy pudding-like texture with a little crunch from the seeds. 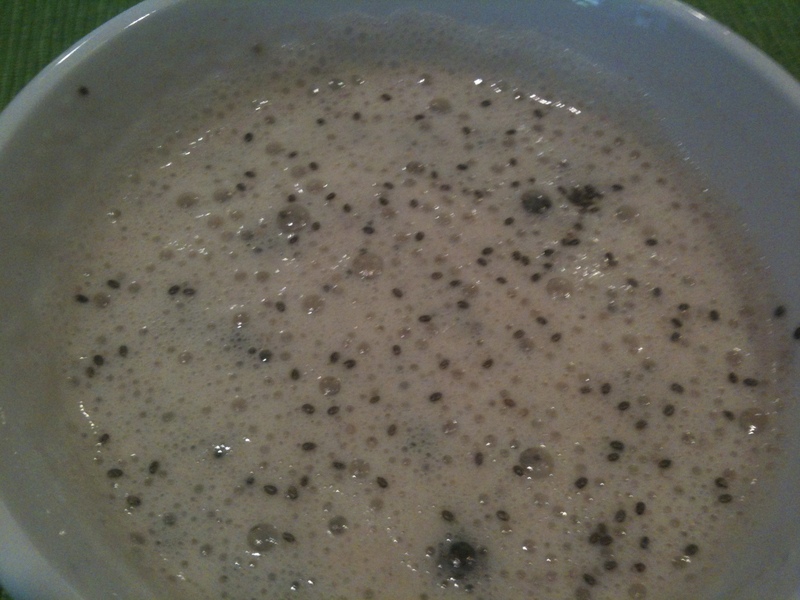 I mixed mine with unsweetened vanilla almond milk that I blended with a couple of dates to sweeten it up. Dates blended with almond milk is delicious and creamy on own! Add a half of bannana and some ice cubes and you would have a delicious shake! You could easily sweeten this with a little honey or agave, but I am really trying to cut back on my refined sugar so the dates are a perfect way to add sweetness without adding sugar. You can also use coconut milk, soy milk or even regular milk if you prefer. You will need to cover and refrigerate your mixture to get it to thicken. I do this step when I first get up and am having my coffee then after I have gotten a few things done in the morning It’s ready to eat. You can also do it the night before, it will just be a little thicker. 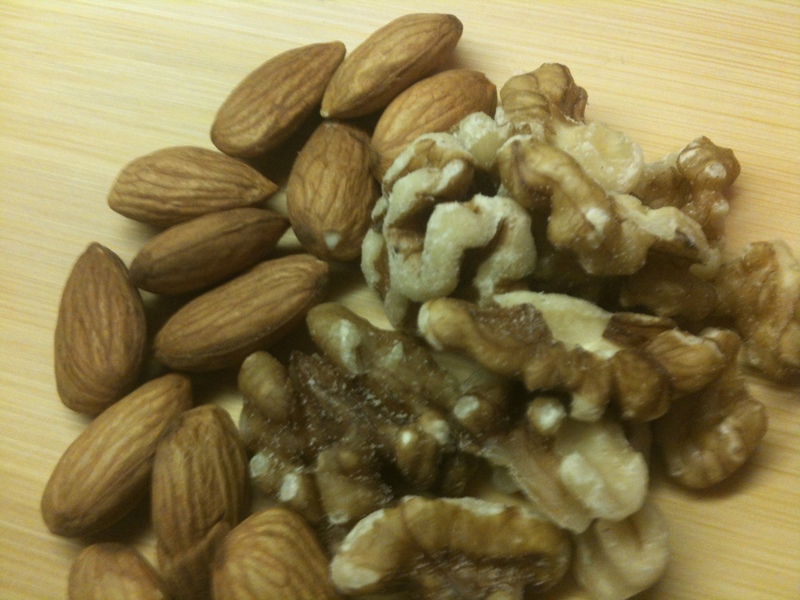 I always have a variety of raw nuts on hand. For this I used almonds and walnuts that I chopped up and toasted in my toaster oven. I just put them on some foil and use the “toast” setting for about 2 minutes. I also toasted some shredded coconut the same way. This is seriously so yummy…I can hardly wait for it to be ready in the morning! Blend the almond milk and dates in a blender until smooth. 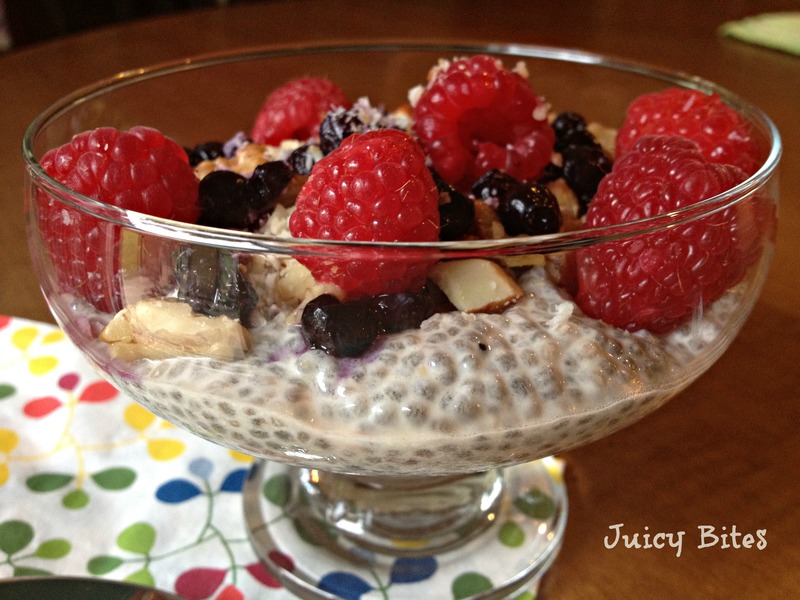 Put the chia seeds and almond/date milk in a bowl and mix well. Cover with plastic wrap and refrigerate for about 10-20 minutes or overnight. Remove from the fridge and stir again. The mixture should have thickened. The longer you leave it, the thicker it gets. 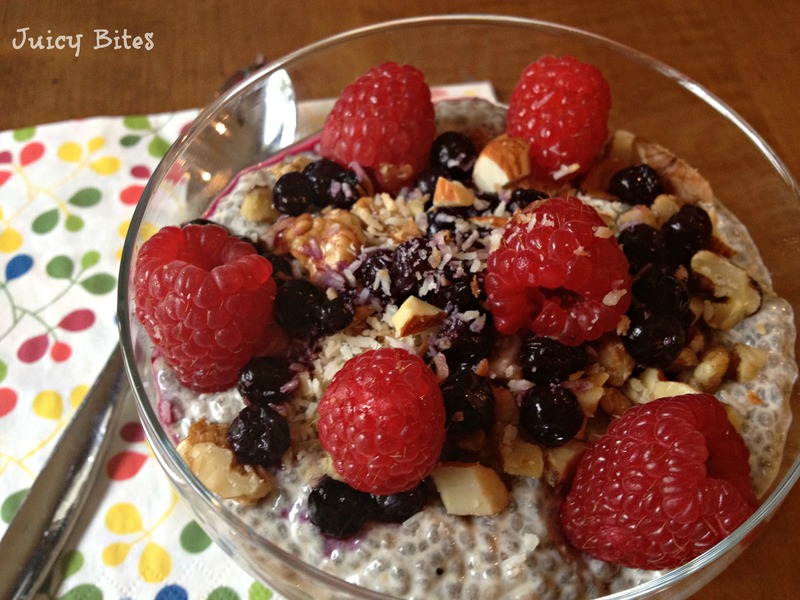 Top with berries, nuts, and coconut and enjoy! Hey Juicy queen, this was soooo yummy, I had it this morning! I kept wanting to try it but the ungodly cost of chia seeds was deterring me. Trader Joe’s just started carrying them for a decent price so I picked up a bag. I blended my almond milk with a frozen banana, and topped it with strawberries, pomegranate seeds and chopped almonds. Simply delish!!! Thanks for the fun breakfast! Yes!! I saw the Chia seeds at TJ’s…so glad they are carrying them now. I LOVE the idea of blending with a frozen banana! So going to try that!